Where do I enter my registration details into TouchCopy? Download, install and launch TouchCopy. The program will start in demonstration mode. Select "Activate TouchCopy" at the top right corner of the main TouchCopy window. You will then be asked for your registration details. 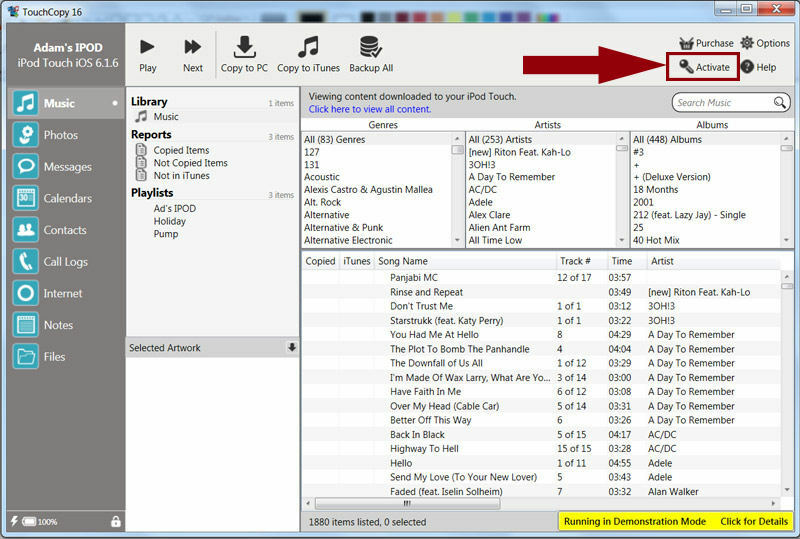 Download the demo of TouchCopy if you have not done so already, visit TouchCopy website and click on the download links. Install TouchCopy on your computer by double clicking on the downloaded installer and selecting "Run". Start TouchCopy by double clicking the "TouchCopy" icon on your desktop (or within LaunchPad on Mac). At the introduction screen Click "Activate". Enter your activation code, and click "Activate". You will be asked for a password, select a password that can be used to re-activate TouchCopy should you need to re-install TouchCopy. Please provide an email address so that your password can be sent to you should you forget it. TouchCopy needs to be connected to the internet in order to activate correctly. Please ensure that your computer has a valid internet connection before activating TouchCopy. Also, please check that any firewall software on your computer is not blocking TouchCopy from reaching the internet. How do I transfer my software licence to my new computer? How do I reinstall my registered version of TouchCopy? Can I install TouchCopy on more than one computer?